More than a race, this triathlon is a 3-day party experience. Participants of all abilities will love everything this event includes, from the music festival and beer garden to kayaking on Lake San Antonio. Come for a challenging half ironman and soak up the buzzing atmosphere. Swimmers will swim in a clockwise direction on a rectangular course which is marked with buoys every 100 yards. The expected water temperature is 65-68 F. Swimmers must wear their timing tag at all times during the race. Start on Shoreline Drive and continue along the beach area (mile 2). Proceed up Beach Hill, a steep 1 mile climb. Turn right on San Antonio Drive (mile 3). Turn right on Interlake Road (mile 7) and then turn right on Jolon Road (mile 19). Enjoy the downhill ride from mile 26 to mile 35. Turn right on Nacimiento Lake Drive and head for the ‘Nasty Grade”. 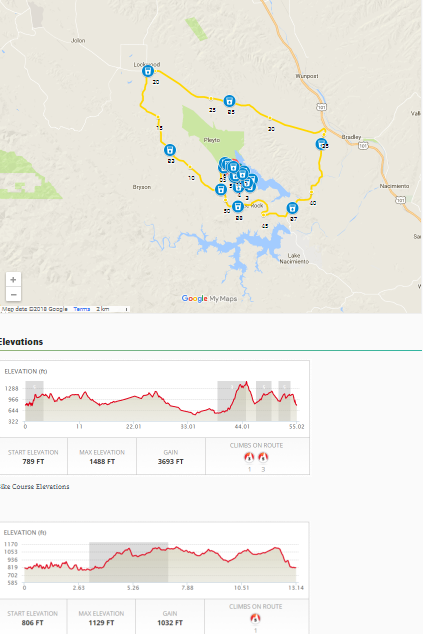 Climb the steep hill and turn right on Interlake Road (mile 41) and keep climbing to mile (mile 45) to “Energized Peak” the highest point on the course where the Bike Premium is determined. Proceed to San Antonio Drive and turn right and then turn left on Lynch Road and ride down Lynch Hill to the transition area. Proceed on Shoreline Drive to “Beach City”, then continue on the fire break to Harris Creek campgrounds and onto at Mile 3. Follow the creek to Long Valley with two steep hills (mile 2.5). Proceed back into the park on trails and fire roads. Turn right into the Redonda Vista Campgrounds (mile 7) and turn right onto San Antonio Drive (mile 9). Proceed to the turn-around at the “Pit” (mile 10). Return back on San Antonio Drive. Turn right on Lynch Road and down Lynch Hill to the finish line.